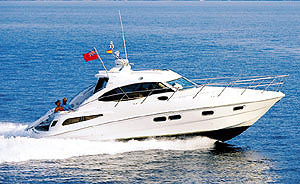 "AS YOU WISH" is a fine example of the 56' NEPTUNUS! This 2005 56' NEPTUNUS EXPRESS is meticulously cared for by experienced owners. Loaded with equipment and all services have been completed on schedule. This 56 NEPTUNUS comes with a 2 Stateroom / 2 Head layout that is roomy and elegant with high-gloss cherry wood cabinetry throughout. NEPTUNUS YACHTS has a tradition of building world-leading semi-custom yachts that are rich in style and detail, yet designed for dependability and performance. 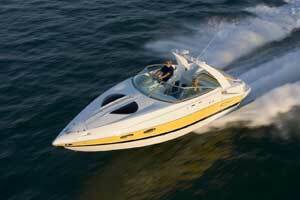 The 2005 56' NEPTUNUS EXPRESS "AS YOU WISH" is no exception. Please see full specs for all of the details. Boarding the Neptunus 56 is easily performed from the large swim platform aft or over the gunwales on either side. 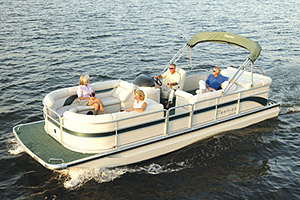 The platform is a hydraulic lift capable of carrying a PWC or tender. The entrance to the aft deck is to starboard up a staircase. 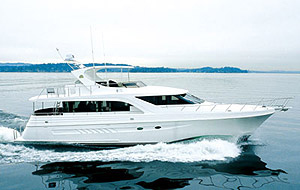 The aft deck area features access to the engine room under the seat; a large U-shaped lounge that converts to a sun pad area; cocktail table; a bar with sink and icemaker to starboard; and a refrigerator and grill to port. 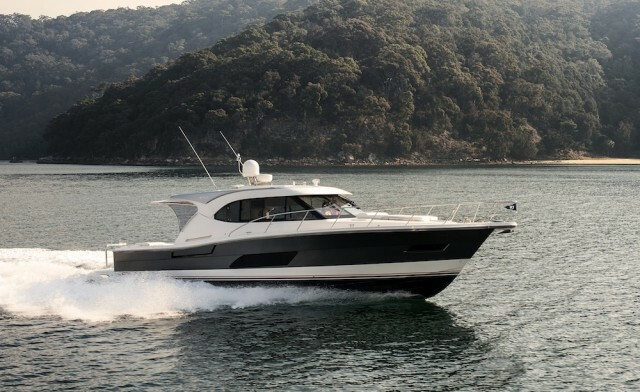 The Neptunus 56 features a helm area and deck level salon in place of the typical cockpit area in most express yachts. This feature serves to offer the owner a second salon up on the deck, adding the comfort of an indoor area. There is a full hard enclosure with polished stainless steel sliding doors, ultra leather L-shaped seating, power windows, and a retractable sun roof. The cabinets are all high gloss cherry wood. There is Samsung 40 inch TV, with Bose surround sound and Direct TV receiver. The helm area features a custom captain’s chair and adjacent forward facing ultra leather seating for two or more. The galley is a few steps down to port and open to the lower salon. It is complete black Avonite counter surfaces, dual-well stainless sink, convection microwave, and 4-burner electric cook top. Separate under counter Sub-Zero refrigerator and freezer units compliment the galley. The lower salon is located on the starboard side of the boat amidship. The area features a 42 inch plasma TV with surround sound system and Direct TV receiver. There is circular ultra leather seating with a high/low electric table. The area has various lighting configurations along with a decorative lighted glass art piece on the forward partition wall. Access to the port VIP head is to port via an arched salon door. There is ample cabinet space overhead for storage. The master is located just aft of the salon, and features a centerline queen size berth with vanity and mirror, TV, hanging cedar-lined closets, as well as en suite head with separate shower, toilet, lighted vanity, mirror and sink.